Business Insider reports that Apple has started tracking users again so advertisers can target them, using a new technology called “Identifier For Advertisers ” (IFA or IDFA). It’s a random, anonymous number that is assigned to a user and their device. It is temporary and can be blocked, like a cookie. The number is used to pass specific adds to apps and web pages when you use your phone, and can be used by companies to identify when a user is looking at their ad and when they are “converted” and make a purchase. While IFAs don’t identify you personally, they do provide a bunch of data about your browsing and purchasing habits. The IFA does not identify you personally — it merely provides a bunch of aggregate audience data that advertisers can target with ads. iOS 6 introduces the Advertising Identifier, a non-permanent, non-personal, device identifier, that apps will use to give you more control over advertiser’s ability to use tracking methods. If you choose to limit ad tracking, apps are not permitted to use the Advertising Identifier to serve you targeted ads. In the future all apps will be required to use the Advertising Identifier. However, until then you may still receive targeted ads. Annoyingly, this tracking is switched on by default in iOS 6—but you can turn it off. The option also doesn’t appear under the “Privacy” setting as you would expect. Instead, you need to go to “General,” then “About,” and then navigate to the “Advertising” section. From there, you need to to turn “Limit Ad Tracking” on. 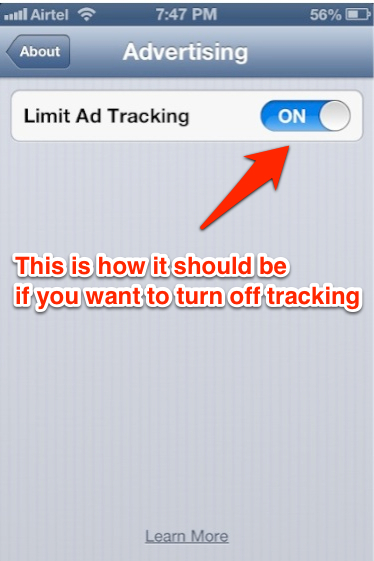 The tracking control is titled “Limit Ad Tracking,” and must be turned to ON, not OFF, in order to work. That’s slightly confusing — “ON” means ads are off! — so a large number of people will likely get this wrong.